Artwork galvanizes local campaigns, and bridges language barriers, forming a powerful tool for building international communication and solidarity. The resistance campaign against Kulon Progo Airport in Indonesia, also called New Yogyakarta International Airport (NYIA) offers some striking examples. Residents of six coastal villages have resisted eviction from their homes and farmland for the airport since 2011. The text on the poster on the right of the top row translates as ‘We strongly condemn destroyers of the healthy environment. We prosper without an airport and mining’, linking the campaign with the grassroots struggle against iron mining. Watermelons are depicted destroying a plane, because this is one of the key crops grown on the site earmarked for the airport, along with squash, eggplant (aubergine), peppers, rice and maize. The anti-eviction struggle intensified on 28th August. Without warning, construction equipment escorted by hundreds of police entered the site, displacing residents and destroying farmland. Citizens attempted to block the entry of the equipment, but were outnumbered by police. Residents of Sukamulya village in the regency of Majalengka, a predominantly rural administrative area in the West Java province, Indonesia, are resisting eviction for Kertajati Airport. They are fighting for their land and water, blocking officials from entering the village to measure land in order to acquire it for the airport. The stand-off between officials and villagers refusing to be displaced, which began on 8th August, is the latest chapter in twelve years of resistance. A plan for a major airport, taking up a land area of approximately 50 square kilometres, first surfaced in 2004. The Front Perjuangan Rakyat Sukamulya (FPRS), which translates as the Sukamulya People’s Struggle Front, was formed to resist eviction for the airport and the campaign is supported by Indonesian land rights and agrarian reform NGO Konsorsium Pembaruan Agraria (KPA). As shown in a video by FPRS, hundreds of people are participating in the protests and women are playing a leading role. Sukamulya is bedecked with flags and banners. Road entrances to the village are being monitored day and night and blocked with tyres, preventing officials accessing land in order to measure it for the airport. A protest camp with a communal kitchen, using food harvested in Sukamulya and donated by villagers, helps maintain high spirits. At the time of writing the blockade has been successful and the latest in several attempts at land measurement have been cancelled. Hundreds of residents blocked entry to the village, succeeded in holding back officials from the land agency, Badan Pertanahan Nasional (BPN) and police. On 1st September, hundreds of Sukamulya residents stated that they were ready to die in order to defend their land and demanded that the government treat them humanely. The action has garnered support from students and Majalengka farmers’ organization. Affected villagers are determined to avoid the fate of people whose land has been acquired for the airport; the level of compensation offered was insufficient for them to afford to buy land and build a house in nearby villages. But the government remains determined to impose the airport project. On 5th September, KPA reported that BPN was preparing to make another attempt to enter Sukamulya village to undertake land measurement, and that officials would be accompanied by a greater number of security officials. Over the twelve years since announcement of the Kertajati airport project there have been a great many protests. On 8th June 2007 hundreds of demonstrators rallied to protest against the threat of eviction facing at least 16,000 people from five villages. Speeches were followed by a mock trial of the Majalengka Regent, the head of the Regency. Demonstrators objected to lack of information about the airport project, including how much compensation they would receive from the government, and refused to be relocated. Some residents have accepted compensation for their land and moved away, but the majority refuse to give land for the airport without fair land acquisition respecting their rights to accurate land measurement and appropriate compensation. Many reject the airport project entirely and are united in their refusal to give up their land for it. KPA maintains that the majority of the population of the 11 affected villages have opposed acquisition of their land and construction of the airport. The FPRS video above documents a major protest on 25th January 2016. Hundreds of residents and their supporters rallied in front of the Majelengka land office and State Attorney office, arriving for the march in a procession of motorbikes and trucks carrying banners and posters. Rousing speeches voiced residents’ opposition to the construction of Kertajati Airport and the land acquisition process, protesting that it was not being conducted according to regulations. Villagers vowed that they would remain in Sukamulya. Hundreds of residents marched again on 22nd February 2016, demanding that delayed land compensation be paid to nearly 400 families and outraged that members of the community were being intimidated by officials. A video of the protest by the Majalengka police shows the presence of a large number of officials maintaining tight control of the demonstrators. On 1st March 2016 the International Land Coalition (ILC) reported that conversion of the land for Kertajati Airport had resulted in the eviction of 10 villages. A tweet by ILC Asia showed a photograph of Iwan Nurdin, Secretary General of KPA, addressing a large group of evicted farmers from the affected villages. On 2nd May 2016 hundreds of Sukamulya residents, supported by FPRS and KPA, rallied at the district government office demanding a fair land settlement. Speakers at the rally protested dishonesty in the land acquisition process including an inaccurate EIA (Environmental Impact Assessment) which stated that crop yields are far lower than are actually harvested. Intimidation by officials had forced some residents to flee from their homes and some had been detained. Sukamulya villagers and their supporters defending homes and farmland from land acquisition for Kertajati Airport have good reason to be concerned that intimidation and harassment by officials may escalate into violence. There have been many clashes between security officials and people protesting against the airport and blocking access to land. A serious incidence of state brutality occurred on 18th November 2014. Without warning, hundreds of officials, surveyors escorted by armed police, arrived to measure land in the villages of Sukamulya and Sukakerta. Hundreds of residents attempted to block officials from entering the village area. Police responded with violence, firing tear gas and rubber bullets. Many citizens were injured from being trampled on and dragged away and some were beaten. At least five people were detained. A video shows a few minutes of the clash between authorities and villagers. Residents, distressed and angry, attempt to block officials from entering their village to conduct land measurement for the airport. Police and army officers herd people away from the village and confine them behind a fence. Many people are handled roughly by officials, pushed and shoved, and several are dragged along the road. The developer of Kertajati Airport is PT. Bandarudara Internasional Jawa Barat (BIJB), referred to in English as West Java Airport and Aerocity Development Company. The planned airport land area, 1,800 hectares, far exceeds that which would be required should the airport meet its ambitious traffic projections of between 8 and 10 million passengers per year in the first phase of development, rising to 40 million passengers per year by 2035. It is larger land area than the world’s busiest airport, Atlanta in the US. In comparison, Atlanta Airport has a smaller 1,518 hectare site which includes a considerable amount of commercial development such as retail and warehouses. Yet Atlanta Aiport handles two and a half times the number of passengers planned for Kertajati Airport, just over 101 million in 2015. It is clear that land is being acquired for non-aviation purposes in addition to the area required for airport operations. Kertajti Airport is envisaged as the first phase of a larger ‘aerotropolis’ project, an airport surrounded by aviation dependent commercial and industrial development that is deigned to maximize use of air services. The full aerotropolis plan, with Kertajati Airport covering 1,800 hectares plus the proposed Kertajati Aerocity adjoining the airport site taking up 3,200 hectares, matches the 5,000 hectare project that was first mooted in 2004. A GAAM map shows the proposed boundary of Kertajati Aerotropolis that was indicated in a November 2015 presentation by a representative of BIJB entitled ‘KERTAJATI INTERNATIONAL AIRPORT & AEROCITY: INTRODUCTION & OPPORTUNITIES‘ at the Indonesia-Australia Business Week 2015. This event, aiming to develop closer investment and bilateral trade ties, was Australia’s largest ever business delegation to visit Indonesia. GAAM’s map superimposes the project boundary indicated in this document onto a 10th August 2016 satellite image of the aerotropolis site. The map shows the area earmarked for the aerotropolis consists of farmland divided into strips and squares, villages and wooded areas. The rectangular area is the proposed site for Kertajati Airport. Adjoining the airport area is the Aerocity area, its southern boundary following the path of a river. In the BIJB presentation the claimed area of the Aerocity is larger than the 3,200 hectares stated by the project and government bodies, at 3,480 hectares. It could be significant that the land area indicated by the map in the BIJB presentation is even larger than stated in the text: 2,665 hectares for Kertajati Airport and 3,583 hectares for Kertajati Aerocity. The first runway can be seen along the northeastern edge of the airport site. A second runway, parallel to the first and near the other edge of the airport site, is planned. Satellite imagery shows that earthworks have already prepared an area of land adjacent to the first runway for construction. The southernmost point of this area corresponds with the access road shown in the BIJB presentation. The footprint of the airport, and obliteration of farmland, threatens to extend beyond the site boundary with construction of access roads to the north and south of the airport area. A major road already runs through the planned aerotropolis site; the Cikampek-Palimanan Toll Road, part of the 653 kilometre Trans-Java Toll Road, runs through the Aerocity area, inside the southern boundary. The Aerocity plan described in the BIJB presentation consists of typical aerotropolis components. Space would be allocated for hotels, retail, conference and exhibition centres, entertainment complexes, business park, offices, industrial and warehousing area, logistics and distribution facilities, aviation ancillary industries including MRO (Maintenance, Repair and Overhaul – of aircraft) and in-flight catering, plus a facility for Hajj and Umrah pilgrims. An ‘attractive incentives plan’, meaning subsidies for investors, is promised. As a greenfield airport, and an aerotropolis, BIJB is not being constructed to serve established urban development, but to spur commercial and industrial development on the farmland surrounding the airport. Plans have been outlined for Kertajati Airport to become a ‘gateway’ to West Java; the airport and Aerocity would be an economic centre for the region, with direct access to the established Karawang industrial zone. Kertajati Airport is just one of 84 large scale infrastructure projects planned in West Java, including power plants, ports and roads, criticized by environmental forum WALHI West Java for the loss of farmland and triggering social conflict. Dianto Bachradi, Vice Chair of Komnas HAM (the Indonesian Commission for Human Rights), highlighted the private sector interests served by megaprojects. Specifically regarding airports he pointed out that employment opportunities for local people facing the loss of their livelihood from agriculture would be restricted to poor quality jobs such as baggage handler or parking attendant, and that the projects benefit large companies, not the local community. As Sukamulya holds out against eviction recent announcements reveal more about the strategic significance of the aerotropolis to government and corporate interests. There is a military component as Indonesia’s state owned aerospace manufacturer, PT Dirgantara Indonesia (PTDI), a firm servicing both civilian and military aircraft, intends to relocate from its current location in Bandung to a larger 300 hectare site on the land surrounding Kertajati Airport, anticipating that the new facility will be operational by 2019. And the aerotropolis scheme has spawned a plan for yet another megaproject; a power plant. This 190 hectare energy complex is planned for the aerotropolis to meet its own energy requirements, as the electricity supply currently under construction will only be sufficient to supply the airport, not the Aerocity. Land acquisition, displacement of villagers, destruction of farmland, construction of the runway, taxiway and apron and earthworks to prepare land for construction of the terminal and access road have proceeded in the absence of confirmed financing to actually build the airport. Repeatedly, the government announced offers and interest from investors, from China, Korea and Turkey and from airport operator/developers including GMR Infrastructure (based in India) and Schiphol Group. In December 2015 President Director of BIJB, Virda Dimas Ekaputra, stated that no less than 40 domestic and foreign investors, from Switzerland, Turkey, Germany, Qatar and India, had expressed interest in development of ground infrastructure, such as the terminal. As yet, foreign investment has failed to materialize, and there has been a series of announcements on financing of construction costs, all of which will fall on the government. On 18th January 2016 it was announced that construction of Kertajati Airport will cost about US$267.4 million, to be paid by central government through the transport ministry. Indonesian President Joko Widodo announced this financing decision during a visit to Majalengka. It was also stated that the West Java government is to pay for clearing 1,800 hectares of land. The government had withdrawn its search for an investment partner for development of the airport, redirecting potential investors to the proposed Aerocity adjoining it. On 16th August it was announced that an as yet unspecified amount of provincial government allocated to the project had increased, the project having already spent most of the US$38 million in provincial finds already contributed. The most recent announcement of state financing is that the first phase of airport construction will be funded by mutual funds including the social security agency for labour. The financing scheme would be underwritten by state owned financial services firm Danareksa. Whilst this funding scheme would spare the government from spending the state budget on construction of Kertajati Airport the state would be liable for the debt incurred. BIJB videos show the progress of Kertajati Airport construction. A video dated 4th February 2016 begins with footage of the airport toll road, already a long ribbon of smooth tarmac. Next there is a shot of road grading for the access road. Bulldozers are shown in a puddled field of mud next to all that remains of a community that has been systematically erased, a tiny cluster of dwellings, and a single tree. The camera pans away to show construction in the midst of a patchwork of green fields and bare earth where vegetation has been stripped away. At this stage, concrete has been laid for 2,500 metres of the runway. A bulldozer gouges at the earth, preparing a level surface for the airport apron, a gigantic rectangle of concrete. The tranquil soundtrack is at odds with what must be a roar of earth moving trucks, bulldozers and heavy machinery. The BIJB video shows development of the taxiway, with drainage channels running parallel. It is evident that the hydrological conditions of the airport site, low level land with a high water table, makes construction difficult. Adjacent to the apron, foundations for the terminal are being laid, and drainage channels dug into the flooded surface. Piles, long concrete posts, here called ‘pickets’, are being inserted deep into the ground. A total of 2,413 of these pickets are being driven down through weak layers of loose ground to reach rock or compacted soil that is strong enough to support the weight of the terminal building. A waterlogged site makes airport construction problematic, and drainage management will be challenging once the airport is operational, but airport operations require large volumes of water. There is a reservoir within the land that has been expropriated for the airport, the pale rectangular area near the southeastern corner. In June 2016, BIJB stated its intention to source its water requirements, initially about 30 litres per second but possibly rising to 60 litres per second, from within Majalengka. Water may be plentiful in the area earmarked for Kertajati Aerotropolis, but it is a limited and precious resource. In Indonesia, the bigger picture is of water scarcity concerns, in particular on the densely populated island of Java. Diversion of water supplies from agriculture to industrialization impacts on irrigation of crops and therefore on food security. 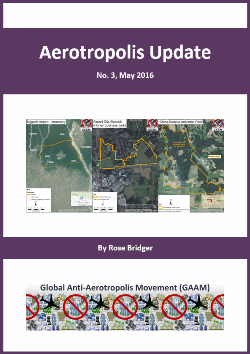 Kertajati Aerotropolis also poses a direct threat to food security due to loss of farmland to urban development. In May 2016 concerns were raised over food security implications of development on Majalengka farmland, in particular the prospect of the loss of 5,000 hectares for Kertajati Airport and Aerocity. Urban development on Majalengka wetlands could lead to a reduction in rice yields of 75,000 tonnes per year. Social and economic problems loom because of the loss of farmers’ livelihoods. In addition to rice many other crops are cultivated on the fertile Majalengka farmland, including beans, peppers, watermelons and mangoes. A tweet posted on 19th July shows sheep grazing on green fields next to the terminal construction site, in the background is a skyline of piles and pile drivers pushing them into the soil. If Kertajati Aerotropolis progresses as planned this fertile farmland will soon be paved over. Recent years have seen several airport-related land tensions and conflicts in Indonesia, in addition to the Kertajati case. About 300 kilometres to the southeast of the Kertajati Airport site, near the south coast of Central Java, Kulon Progo residents have struggled against loss of land and livelihood for a new Yogyakarta airport since 2011. Opposition to land clearance stalled construction of Kuala Namu Airport. It was expected to commence operations in 2009. In May 2013, as the airport prepared for opening, residents were still refusing the compensation on offer for eviction to make way for toll roads serving the airport. A week before the Kuala Namu opened, in July 2013, land disputes continued in five villages and more than 100 residents blockaded an arterial road. A proposal for a second Bali airport, in the north of the island in the Buleleng Regency, was criticized due to pending displacement of agricultural communities and the sociocultural shock that would be inflicted on nearby villages, leading to an alternative plan for an offshore ‘floating’ airport. Yet the latest report on the new Bali airport plan still entails acquisition of populated land, stating that 656 hectares is required, predominantly residential land. The coastal villages of Pejarakan and Bumberkima would be affected and 3,335 people relocated, in order to offer wealthy tourists ‘panoramic views of white sandy beaches’. The elitist project aims to ‘cater to deep pocketed clients, servicing private jets’. Along with the airport investors intend to build aerotropolis-style development: hotels, restaurants and a yacht port. In West Papua, dozens of families are refusing to be evicted for development of Manokwari Airport, and Sentani Airport finally agreed to pay compensation for acquisition of customary land in May 2016, after members of the four affected tribes blocked the taxiway with banana trees. In 2013 operations at Sorong Airport were disrupted by a rally demanding compensation for land. Anti-airport movements in Indonesia are mindful of the long history of state brutality against people protesting confiscation of farmland for Lombok Airport. In the mid-1990s hundreds of families were evicted from 800 hectares of farmland for the airport. Oppression continued and in 23rd August 2005 a further 2,631 people were forcibly evicted for the airport. Then, on 18th September police, without provocation, fired into a crowd of 1,000 people who had gathered to commemorate Indonesia’s National Peasant’s Day and protest construction of Lombok Airport on fertile farmland. Thirty-three protesters were injured, 27 of them by gunshots, six from being beaten by police. Kertajati aerotropolis is part of a wider Indonesian government drive for massive aviation growth. A target has been set to build 62 new airports over the next 15 years, in particular in isolated areas, which would bring the country’s total number of airports to 299. Inevitably, a number of these new airport projects will impact on rural communities and trigger resistance to displacement.